Classy and glamourous that’s how your nails are going to feel after a pampering session here. While you kickback and sip on French wines, the magicians here will transform your nails into a work of art. And to achieve this, they use negative spacing, glitter, matte looks and geometric patterns. Newly renovated, Polished in Indiranagar is a crowd favourite. They have a seemingly endless range of products and polishes to ensure that you walk out with artfully done up nails. You can sign up for floral patterns or marbled nails or metallic colours. If you prefer to keep things fuss-free, then you can sign up for mani-pedis (INR 750 onwards) and finish off with French tips. A spiffy spot on New BEL Road, this nail studio thinks outside the box when doing up your digits. You can start off with a manicure (INR 650 onwards) and then get them to glam up your nails with chevron patterns or with sparkling stone work. They also offer an Icecream Pedicure. Yep! You heard that right. Want your nails to look like they are straight out a picture book? Then, do swing by this salon near Ulsoor Lake. You can show off with diamond-encrusted nails with little hearts embedded or keep it cute with butterflies imprinted into your nails. Mermaid scale and chrome nails are options too. This St. Mark’s Road studio is all about keeping up with the trends. 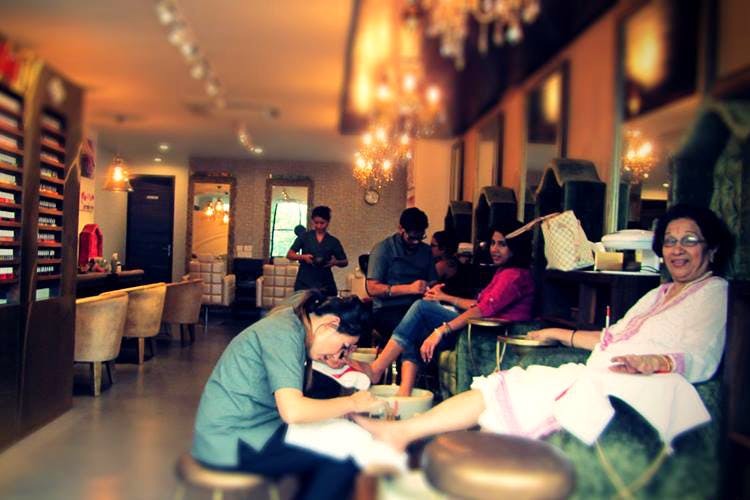 You can plonk yourself into their comfy, salon chairs and surrender your nails for a thorough spruce up. They specialise in the latest Instagram trends like the ultra-shiny chrome nails or the streaked cat eye effect. You can also make those talons sparkle with stones and glitter. Prices begin at INR 3200. Look sharp with stylish nails from this Whitefield salon. You can make your nails pop with metallic hues or mosaic ones. If you are looking for real showstoppers, then, add aztec prints or delightful flamingoes or even festival-themed creations.